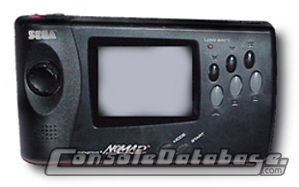 The Sega Nomad is a handheld Sega Genesis, released in October 1995 (for US$180) in NTSC format only (however, there is rumour of a PAL prototype). The idea was really good because of the already huge library of Genesis games that could be played on the console. But it was fairly bulky with a short battery life (6 AA batteries last 3-5 hours) and its high price meant that it wouldn't sell well. Being released so late also meant that people wouldn't buy it because of the new 32-bit consoles of that time. The Nomad comes with a colour screen, AV output jacks so it can be connected to a television via AV cables, a jack for an AC adaptor, and a controller port for a second controller. No games were made specifically for the Nomad, all were just Genesis games. For any game information, please see the Mega Drive/Genesis sections.